Yves Saint Laurent will launch Le Vestiaire des Parfums later this month. The collection of five fragrances represents an 'olfactory reinterpretation' of cult pieces from the Yves Saint Laurent wardrobe: Tuxedo, Caban (pea coat), Saharienne, Trench and Caftan. Yves Saint Laurent Le Vestiaire des Parfums Tuxedo, Caban, Saharienne, Trench and Caftan will be available in 125 ml Eau de Parfum, €240. 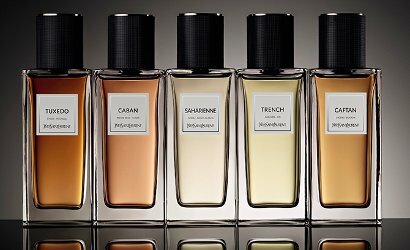 Update: longer descriptions above in brackets are via Bergdorf Goodman, where the fragrances are $250 each. I’m such a fan of Slimane too. Hope there’s a coffret set released of these. Most of these sound fantastic (especially Trench) but more than a bit shy due to the cost. Trench & Caftan sound especially good. I’m WAY more than a bit shy though. Ugh perfume name recycling! (Tuxedo was a Ralph Lauren perfume if memory serves) . And I can hardly believe that YSL got their hands on the name ” Trench “before Burberry. What is this world coming to? Caftan is the one that piques my interest. Caftan sounds wonderful… but that’s a lot of clams. Yep, Caftan had me just about to hop off to Basenotes and Fragrantica to add it to my wish lists, until I saw the price. For US$272, there are other fragrances I’d choose first. I’ll turn my heart into stone and stop caring for all new releases. There’s no point anymore.. With those unjustifiable prices it’s getting way beyond my reach. I’ll settle in a couple “worthy their price” perfumes a year and the rest I’ll leave it all to Lady Luck. I saw a new perfume the other day, sorry cannot recall which one, which comes in a cashmere pouch and as you can imagine the price was ridiculously offensive. 300€.. For an effing cashmere pouch. Dear God.. Seeing these cookie-cutter minimalism, exclusivity, and editions just leaves me cold. Don’t get me wrong: they could be good perfumers, but I want to see something like a bang of the bygone era. It is disheartening to me – 10 years ago you could get a very fine fragrance for $70-$100. Now that price category is turning to trash (hello, Chanel! ), and what used to pass as a great fragrance is working it’s way into this ridiculous prestige category of $200++. Very disheartening for sure. Esp. b/c these prestige frags are usually just a pig in a dress. Do not be disheartened! Remember what most of us love and cannot live without is still under 200 clams a bottle and most is less then that! I beg you to remember that most bottles from independent perfumers are between 50 and 150 still and these are by far the most interesting fragrances with the largest percentage of natural oils out there! Be of good cheer! ACK! Add another set of Prestige scents to my DESIRE List along with the TF Private Blends, Chanel Les Exclusifs and the Dior’s, Herrera’s, Armani’s and Countless others! Those Bottles are Sublime and Elegantly Gorgeous and I hope they make a Stateside showing… I Love all these Niche lines like this!